As the Concrete5 5.6.x marketplace has discontinued sales, if you wish to purchase any of my add-ons or themes (for 5.6.x) please send me a PM for instructions on direct payment via Paypal. Once payment is made I'll email you the zip file within 24 hours. Please check out all of our add-ons and themes at c5extras.com. This theme is compatible with Concrete 5.5. "WOW!" - one word to describe this theme. 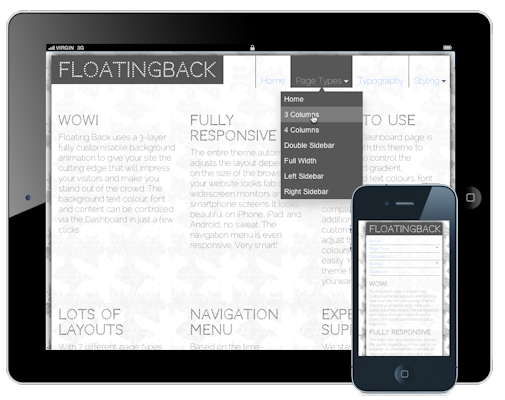 Floating Back uses a 3-layer fully customisable background animation to give your site the cutting edge that will impress your visitors and make you stand out of the crowd. 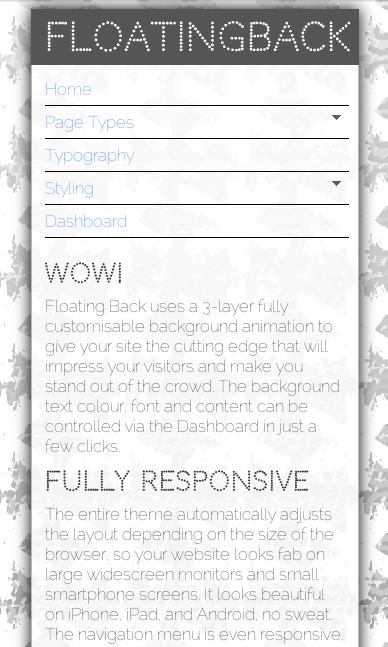 The background text colour, font and content can be controlled via the Dashboard in just a few clicks. The entire theme automatically adjusts the layout depending on the size of the browser, so your website looks fab on large widescreen monitors and small smartphone screens. It looks beautiful on iPhone, iPad, and Android, no sweat. The navigation menu is even responsive. Very smart! A custom Dashboard page is installed with this theme to allow you to control the background gradient, background text colours, font and contents. 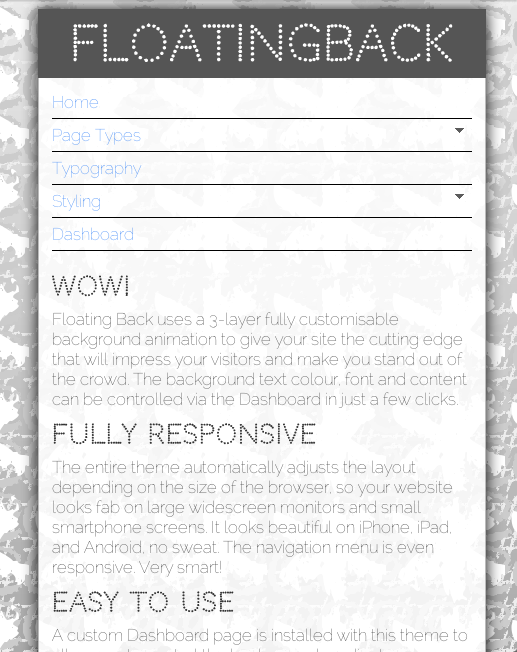 The speed of the background animation is also completely customisable. In addition, there are 21 customisable styles so you can adjust the navigation menu, link colours and text colours so easily. 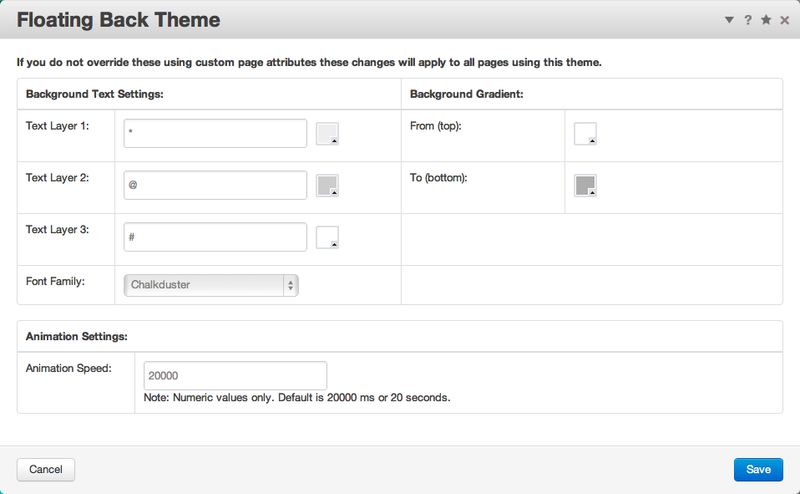 You can personalise this theme for your site just the way you want it. 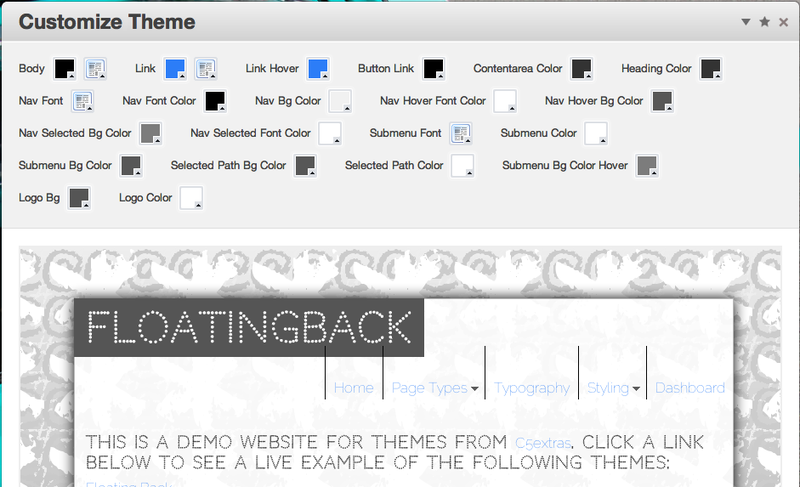 With 7 different page types included, this theme is flexible enough for almost any website. 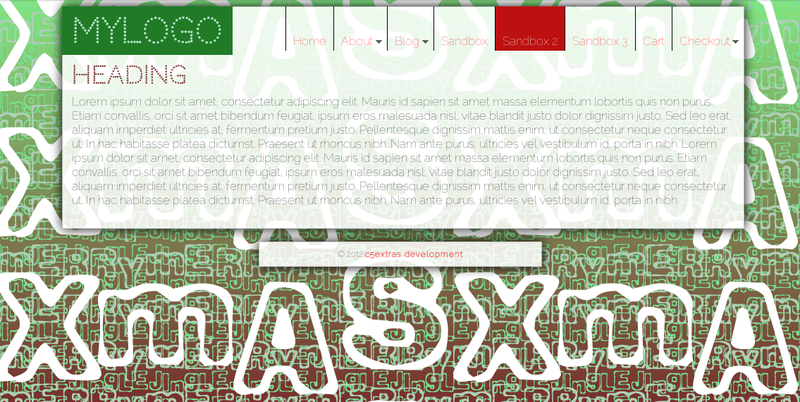 Included are: home, 3 column, 4 column, double sidebar, left sidebar, right sidebar, and full width. A custom block template for the "page list" block, which includes an optional thumbnail image for each page, is included to make any blog look awesome... instantly! Based on the time-tested Superfish drop-down navigation menu system, the colours of the integrated menu system are fully customisable via the Dashboard. It supports up to 3 levels of menus. And the menu automatically is adjusted to a vertical list on mobile devices so it looks beautiful and is always easy to use. We stand behind our add-ons & themes. If you have a post-sale question, just open a support request via the Concrete5 marketplace and we'll respond quickly. Or for a pre-sale question, just send us a Private Message (PM) via the Concrete5 website. Check out more of our quality Concrete5 themes & add-ons at our website and follow us on Twitter for exclusive discounts. Replies to tickets every business day.